N13VB was built by John Stanin, Lawrence MA. 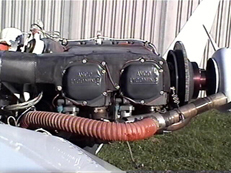 John built a very light, fast, Varieze using many home built parts including throttle quadrant, engine mount, engine induction system and most metal fittings. Workmanship is superb. Top speed was about 150 kts and I was so thrilled to fly her. For 1 year, I ignored the paint bubbles and water blisters and impossibly difficult cold weather starting of its O-200-G (ground power unit) engine. After a magneto failure and then a broken throttle cable I decided on a full winter overhaul at home. Two and a half years later, after lots of advice and encouragement from my Long Eze mentor John Moss, I flew again. The work done included sanding off the heavy RAF micro and re-profiling with West system and replacing the O-200-G engine with a rebuilt O-235-J2A. 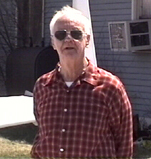 The updraft cooling was retained for one more year until the sight of broken baffling and slightly cooked No.4 cylinder (the result of dog fighting with Bob Englert ) prompted some serious thinking. Also, despite the more powerful engine, and 175kts top speed, Bob and Ken Miller were still way faster. The NACA scoop would have been a good speed mod but did not address the updraft cooling problem, plus it makes the bottom end look ugly. Armpit scoops looked better but still cooled the exhaust pipes before cooling the cylinder heads. 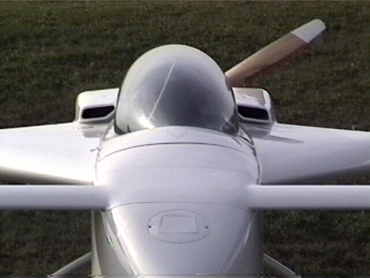 I also wanted to reduce drag by putting those top cowling bumps to some use. Inspiration came from a number of sources. I had spent Oshkosh 93 looking at Pushy Galore and talking to Gary Hunter about that tiny side intake. 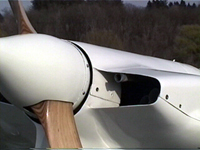 There was an article in Sport Aviation about Nemesis and a picture of a lovely plenum. There was also a photo of a military LongEze with top-side intakes in the CSA newsletter. 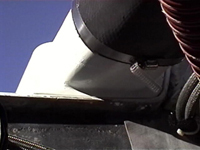 An initial balance sheet of pros and cons came out in favor of two top-side intakes feeding separate plenums. Now that the aesthetics and design prejudice had been decided, it was time to look for scientific justification for my choices. I made some working assumptions after reading all the NACA technical reports I could find on the subject of air cooled engines. (http://techreports.larc.nasa.gov/cgi-bin/NTRS) Select NACA full text reports, and search for "air cooled cylinders". The number of hits is astounding and makes my efforts seem more like archaeology than I want to admit. All the relevant reports are pre-war. Try NACA report 719 " The problem of cooling an air-cooled cylinder on an aircraft engine" and report 555 "Airflow around finned cylinders." I learned that cylinder head temperature was related to the mass of fuel/air mixture being burned, and that cylinder temperature is related to mass of cooling air flow which in turn depends on pressure difference across the cylinder. I also learned that with our fixed pitch propellers, engine power is limited at low speeds and can only reach a maximum at top speed at sea level (with a max CHT mixture if you dare to lean). 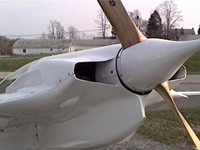 Our large speed range and fixed pitch propellers were actually an advantage. A simple idea, but not so easy to implement! It seemed that nature had conspired to give canards an Eze solution to cooling efficiently with plenums. 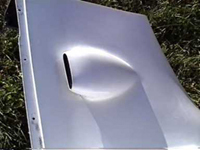 My reading also showed that submerged NACA inlets are only slightly better at pressure recovery at lower mach numbers. 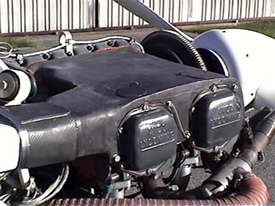 In any case, my intakes were meant to hide the cowling bulges and so traditional ram air intakes were used. As a first step, Ken Miller helped me install an Allegro engine monitor and fuel flow gauge. I would need to measure CHTs and EGTs to validate what I was doing. I also borrowed an ASI from Bob Englert to measure the pressure difference across the cylinders. I started by making and installing RTV/Bid baffles on the cylinder heads and bases. I used three layers of bid and the wraps are substantial. Maybe two layers would have been sufficient. These were made flat on a work surface with plastic wrap on each side, and before the RTV set, I trimmed them to rough shape and wrapped them around an old cylinder to dry. Duct tape kept the wraps in place until final trim and glue to the fins. This resulted in a neat installation. Small patches were RTV'ed into the gap between the cylinders. The plenums were built in situ. 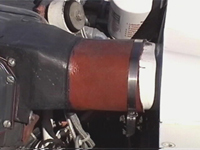 Duct tape on the engine and cylinder wraps, defined the boundaries. Bid tape reinforced the perimeter and made for a lip around the edges. I also used pre-made 3-ply sheet to make small reinforcements at attach points. Urethane blocks were super glued together and shaped on the engine and then two plies BID were laid on top. Corner reinforcements and one more ply were added to the inside after removing the foam. Lots of trial and error fitting resulted in a good seal all the way around. The two plenums are very different. The left plenum forward of number two cylinder has to fit behind the oil pressure control valve, and the right side plenum needed a small detachable section forward of No. 4 cylinder to allow easy removal. Further simplification of this design is possible. Small removable panels on each plenum allow for easy replacement of the automotive spark plugs. 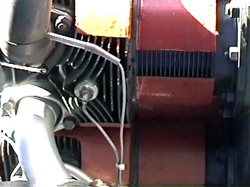 The intakes are separate structures that are RTVed to the strakes. Short ducts made with 3 plys of Bid/RTV connect the intakes to the plenums. 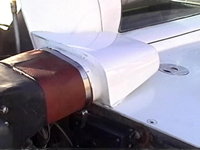 The intake cross section doubles in area by the time the duct feeds to the plenum. The slope is gradual and the inside of the inlet is smooth. 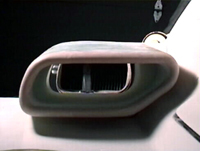 The inlet lips are rounded like an airfoil nose section. The inlet is kept clear of the boundary and has a smooth interior. A custom made BID duct joins the intake to the plenum. The left plenum duct does a wiggle around the oil filler tube. This is an unsatisfactory compromise. 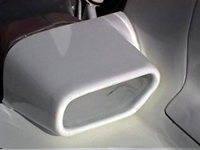 An alternative would involve moving the oil filler tube to the unused left magneto cover plate or to the rear crankcase vent hole. I would then add an oil level sight gauge to the rear of the sump. Not having space to turn the plane over, I had to add a removable body plug to modify the bottom fuselage shape. 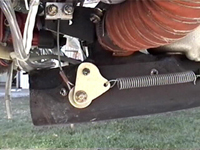 The underbody plug contains the removable carburetor intake filter element, and is joined to the new intake box with a short Bid/RTV duct. 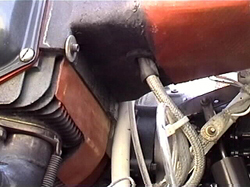 The carburetor air box contains a selector valve for hot air. 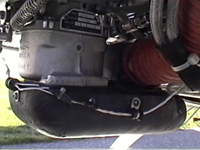 There are two hot air feeds from homemade exhaust cuffs. I tried using air bled from the left intake to feed the oil cooler. First flights suggested this was not working very well. A shortcut solution was to provide a separate ram intake for the oil cooler. This is located below the left strake. All these changes necessitated several changes to the cowlings. 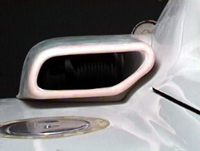 The straight exhaust pipes finish 3 inches inside the cowling and are positioned in the middle of the exit openings so that there is a good augmented flow effect. I also added the two C shapes to the top and bottom cowlings so that they form a shroud around the space between the starter ring and the spinner. The ring so formed also stiffens the cowling at the rear and makes redundant the transverse reinforcements, which in the past tended to trip the airflow coming out of the cowling. The first intakes shown in CSA XXXX and the larger second version were not very good, with lots of spillage around the sides. The 3rd version lifted the intake lips clear of the boundary layer but were too large. The 4th versions seen in these photos are still slightly too big but I will keep them for a while. I am rather pleased with the visual results. I am probably loosing some speed from the drag created in the corners of the fuselage/strake junction. A boundary layer bleed into the cowling might improve this but I doubt it. Each side intake is about 8.5 sq. inch area. Test flights over the last three years have confirmed my assumptions about the relationship between TAS V engine power and TAS V Plenum pressure, and hence TAS V CHT. 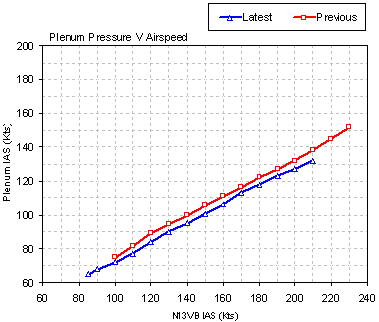 The pressure difference across the cylinders was measured with an ASI. The graph shows version 3 and version 4 results. From my technical reading I came to the conclusion that a full power low altitude continuous 2G turn would tax the cooling system enough. I managed to keep this up for 5 minutes without getting too dizzy. The CHTs settled well within limits and even allowing for non linear increase in CHT with increase in ambient temperature, I know I will stay within limits at up to 100F ambient. That will do nicely for the North East, and Bob had better watch out next time he tries to get on my six. These cleanups improved the top speed to about 185 kts on a good day. The incredible benefit has been superb cooling to all cylinders. The BID/RTV cylinder wraps have been trimmed so that the CHT spread is only 5 degrees F at cruise. Recently I installed my spare Performance prop, which allows more power to be developed at lower speed and this is reflected in higher temperatures after takeoff. I have seen CHT's as high as 426 F with this prop but only after extended engine run up before takeoff. Would I do this again. Yes!! You bet! but maybe not the same way. I would move the oil filler tube. I would also move the oil cooler to the back of No.2 cylinder and maybe take carburetor intake air from the back of No 1 cylinder. This would clean up the underside completely. 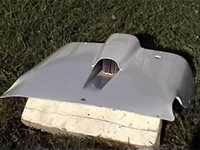 I would also consider NACA scoops into the top of the cowling, as demonstrated by Bill James, although I have a problem with the aesthetics of these. Ram air scoops provide equally good pressure recovery, while NACA scoops might give lower drag with careful design. I will let others do the experiment. At Rough River last year, I was asked by a few people to write about my version of DD cooling. I can only apologize for the slowness of my response. I am also working on a more detailed description of the construction method for those who are more curious than average. The usual caveats apply. The document will be for your education only. Best of all results����. she looks fantastic!